Morning, big huge thank you to everyone who attended my weekend class, both Friday and Saturday were fabulous days with so many passionate, inspiring funny people, I loved it. Today we’re putting more classes online for next year as well as creating a gift voucher for the classes since we’re getting emails in by the sack full asking about them for Christmas, fear not all online later today. In the classes I talk about layers and the importance of them (here she goes again I here you cry), stay with me, as this idea is as simple as anything. 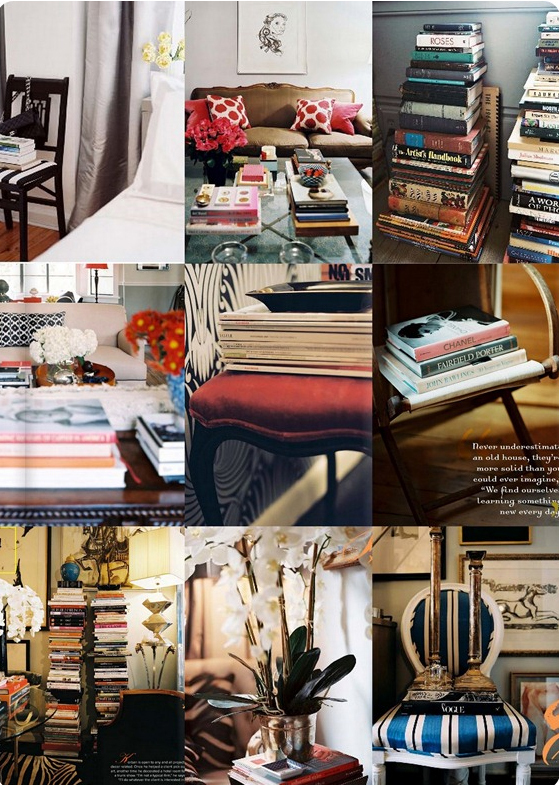 If you’re room is feeling a little bland and needs a tad more personality start introducing books into your space. Iâm talking about plonking them on consoles, mantles, chairs, shelves even the floor. Pile them up into little groups, plonk a posy of blooms on top, a scented candle, a decanter of whisky, a plant and wham bam you’ve suddenly given your room a little soul. They don’t by the way have to be posh arty tomes, catalogues, magazines, novels all do the trick. Infact just yesterday in from spending most of the afternoon in the garden I felt I needed to ramp up the height of one of my lights, a Â couple of books later they elevated it to a new status (and height).